Two words of critique – Mobile. Phone. 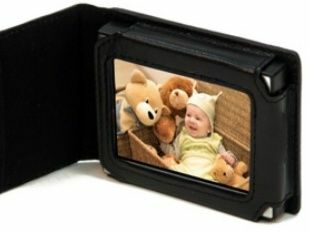 Nextar's new portable digi photo frame - the ideal Xmas pressie? Or the most pointless gadget of the month? You decide. If you are already wondering what to buy your mum or gran (or elderly aunty that smells a bit of gone-off lavender) for Christmas, then this new portable digital photo frame that they can carry in their handbag might well be just the ticket. The Nextar folio digital photo frame features a nifty little 3.5 inch LCD TFT flip-screen and the whole unit folds over into a neat and compact 3.5" x 2.75" x 0.5". Your mum can then show off those embarrassing photos of you to your new girlfriend over the Christmas turkey in sparklingly clear 320x240 JPEG images. She can even slideshow your embarrassment, should she so choose. There are various built-in memory options (128MB or 256MB) and a card slot supporting SD, MMC, or MS cards. And it ships with a rechargeable Lithium Ion battery and AC adapter, costing $69.99 for the 128MB model (plus international shipping charges, of course). If we were really being finickety, though, we could critique the very concept of this product with two words.